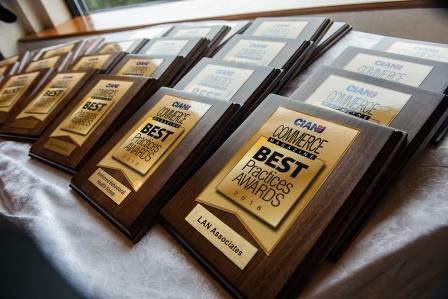 The Commerce and Industry Association of New Jersey (CIANJ) and COMMERCE Magazine welcomed business leaders to their 5th Annual Best Practices Conference saluting innovation in the workplace. More than 150 executives participated in the conference which kicked off with featured speeches from select leading firms. Business executives shared how they empower their employees, creating sales leaders, innovators, rainmakers, brand ambassadors and effective team players. Nearly 40 companies were honored at the conference, including LAN Associates. Over the past several years, LAN has implemented a successful Brand Ambassador program to further develop staff and best practice initiatives. The program is geared towards architects, engineers, and design professionals and contributes as a driving force to the success of the company. With the participation of LAN’s Brand Ambassadors, the company has expanded its presence within various local and state organizations, significantly increased relationships, provided in-house training and seminars. All of these practices have helped shape a dynamic and innovative culture in the workplace. The Best Practices Awards were given to company and business leaders selected by a blue-ribbon panel of judges assembled by CIANJ. Each September, CIANJ holds its Best Practice Conference, where innovative business executives can receive their awards and discuss how they successfully integrate a culture of learning in the workplace.